Corporal John Anthony "Jay" Sampietro, Jr.
Corporal John Sampietro was struck and killed by a vehicle while investigating an early morning accident on I-44 in Webster County. He was assisting the agency's Major Crash Investigation Team by directing traffic around the crash reconstruction site when he was struck by an SUV as traffic merged into one lane. He was transported to Cox South Hospital where he succumbed to his injuries. He is buried in the White Oak Cemetery in Rogersville, Missouri. The suspect plead guilty to involuntary manslaughter and was sentenced to seven days incarceration and five years probation. 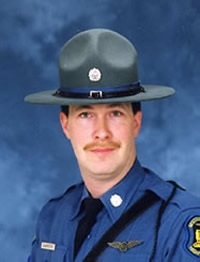 Corporal Sampietro had served with the Missouri State Highway Patrol for 13 years, and was assigned to Troop D Springfield. He is survived by his wife and two young sons. Number 13. A number that I should never have had to think about, just like the twelve before it. Thinking about you today and everyday my brother. Miss you Bird!! !